Bellary district of Karnataka and Goa portray India’s very own gold rush. Today, they are the bywords for rampant violation of mining and environmental laws, unscientific depletion of resources and concentration of mining profits in the hands of a few. The plunder has also spread to other iron ore-rich states of the country. It all started around 2003-04 with China going on a construction spree in the run up to the 2008 Olympics. Before 2003, it used to buy only high-grade iron ore, with at least 58 per cent iron content. But with the Olympics approaching, it started procuring even fines (ore in powder form) and ores with as low as 45 per cent of iron content. The Chinese developed technology that enabled them to mix this low-grade ore with very high-grade ore imported from Brazil and Australia. The Chinese demand also pushed up the international prices of iron ore. This paved the way for chaos and scams that India’s iron ore-rich states witness today. Everyone hoped for a windfall from the sudden demand. Those who owned mines and those who did not mined without clearances, encroached upon forest and other’s lease areas; and excavated, transported and exported more than permitted. No one stuck to the approved mining plan. They even extracted minerals from waste dumps. It was a colossal plunder in connivance with the state governments, Union Ministry of Environment and Forests and IBM. The states lost revenue and the nation its rich resources. In the process of reckless mining, forests were cleared, hills were ravaged, farmlands were destroyed, streams and rivers were polluted, groundwater got contaminated, and the health of people and livestock was compromised. Government-appointed committees entered the scene and unearthed shocking stories of illegalities and loot of iron ore. They also brought to the fore the intertwined interests of politicians and industry and the failure of the authorities to regulate mining. Karnataka and Goa were the first ones to come under scanner. In Karnataka, the Lokayukta, the state’s ombudsman, estimated in its July 2011 report the total loss to the state exchequer at Rs 16,085 crore. The Supreme Court-appointed Central Empowered Committee’s (CEC) interim report on Bellary in April 2011 estimated that between 2003 and 2010, Rs 15,245 crore worth of iron ore was illegally exported from the region. It recommended a ban on mining in the region. But in its February 2012 report, CEC backtracked and recommended resuming iron ore mining in Bellary and two other districts subject to conditions. It prescribed a model on the basis of which legality of mines can be categorised and they can be allowed to operate. It also suggested ways to restore the devastated ecology of the region (see ‘Bellary to bleed again’). Mining companies in Goa are now going through the tests that Bellary was put through in the last two years. Surveys are under way, data is being compiled, accounts are being audited. Justice M B Shah Commission, constituted by the Centre in 2010 to probe illegal mining of iron and manganese ore in the country, has submitted its report, following which the Goan government has imposed a ban on mining of iron ore in the state. One of the key findings of the Shah Commission is that the state is incurring losses to the tune of Rs 35,000 crore due to illegal iron ore mining. The Supreme Court is also hearing the matter. 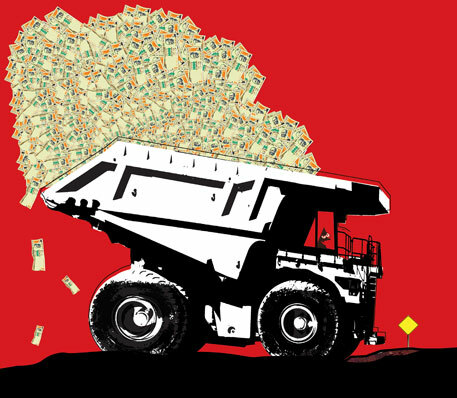 As CEC is estimating losses from illegal mining in Goa, the mining industry in the state is under constant fear that CEC might recommend the Bellary model for Goa’s mines (see ‘Goa next’). The next in line is Odisha. The 2010-11 report of IBM shows Odisha produces the maximum 37 per cent of iron ore in the country, followed by Karnataka and Goa (see graph). The Shah Commission has already heard mining companies and is preparing its report on the extent of illegalities in the state. The Supreme Court’s Bellary judgement is the first of its kind in a mining case involving illegalities, irregularities, criminalities and corruption of unbelievable magnitude, and sets a precedent for all cases related to illegal mining, be it in Goa, Odisha, Chhattisgarh or Jharkhand. M Suchitra from Bellary and Sugandh Juneja from Goa analyse whether it is possible to safeguard the environment while keeping the industry happy and if the Supreme Court order for Karnataka can be a one-size-fits-all policy. It’s sleepless nights again for the residents of Kamtur village. Located on the fringes of the Kumaraswamy forest range, one of the six iron ore-bearing mountaintops in Karnataka’s Bellary district, Kamtur is surrounded by seven mines. On April 18, the Supreme Court eased ban on mining in Bellary, which used to be the nerve-centre of India’s illegal iron ore mining till two years ago. Kamtur residents say they have lost almost everything to the frenzied mining—their fields, crops, grazing land, streams and even a large portion of their common burial ground. “Mines were encroaching upon us from all sides,” says N H Malleswaram, a member of the gram sabha. Most people sold their land to mine owners under threat. Those who managed to retain their land could not grow anything as piles of red iron dust rendered their fields barren. “We want to live without iron dust in our lungs,” says 70-year-old Thimmappa. Like many others in the village, he also suffers from breathing difficulty. The primary health centre in the village is a small, unfinished building where cattle take refuge from searing heat. The Supreme Court ban in July 2011 had offered them some relief. During the ban, only the National Mineral Development Corporation (NMDC), India’s largest public sector mining company, was operating in their neighbourhood. On April 18, the court lifted the ban on 90 iron mines with certain conditions. With this, 108 of the 166 mines in Bellary, Chitradurga and Tumkur may soon be back in business. Eight of the 18 mines that received the court’s approval in September last year, are operating. The court’s judgement is based on the recommendation of its forest advisory wing, the Central Empowered Committee (CEC), which probed illegal mining in Bellary and the two other districts. The court had ordered the investigation after Samaj Parivartana Samudaya (SPS), a non-profit in Dharwad, filed a public interest petition in 2009 against the state government for not curbing illegal mining in the region. While Kamtur and several other villages in the hinterlands of the three iron ore mining districts are worried, mine owners and ore-starved steel industries rejoice over the judgement. “Since the ban we have been operating at 60-70 per cent capacity due to ore crunch,” says P K Murugan, vice-president of JSW Steel. JSW, one of the largest integrated steel companies in India, requires 60,000 tonnes a day for its plant at Toranagallu in the heart of high-grade iron ore belt of Bellary-Hospet. “We want mining to come back in full swing,” hesays. Srinivasa Rao of Karnataka Sponge Iron Manufacturers Association, says the ban has rendered half of the 70 sponge iron plants sick. 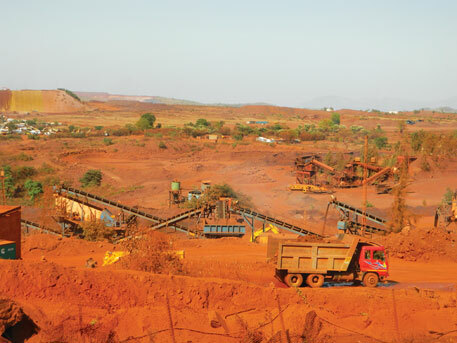 What attracts these mining and steel companies to Bellary is its rich deposit of reddish-brown haematite iron ore, a high-quality ore with iron content up to 65 per cent. A 2005 estimate by the Indian Bureau of Mines (IBM) puts the reserves in Bellary at 1,148 million tonnes. Before the ban, Karnataka produced about 40 million tonnes per annum (MTPA), one-fifth of the country’s annual iron ore production. Eighty per cent of this came from Bellary. But this was just the official figure. The actual production of iron ore through illegal mining was much more and so was illegal export (see ‘Illegal export...’). The sudden spurt in iron ore and steel prices in the international market following China’s demand was showing its impact. Bellary had become the byword for plunder. “The government took no corrective measures even after the Lokayukta, the state’s Ombudsman, filed a detailed report in 2008 on illegal mining,” says S R Hiremath, president of SPS. The report brought to light chilling stories of illegalities, irregularities and crimes by the mining mafia in connivance with politicians and bureaucrats. Bellary was transformed into a republic of lawlessness by mining baron Gali Janardhan Reddy, his brothers Karunakara Reddy, Somasekhara Reddy, and their close associate B Sriramulu. In 2008, they became part of the BJP-led state government. Janardhan Reddy became tourism minister and miniter in-charge of Bellary, Karunakara Reddy the revenue minister, B Sriramulu the health minister and Somasekhara Reddy headed the state milk development corporation. There was tremendous political pressure on the mines department to issue new leases. Even when the state’s requirement was 20-25 MTPA, IBM gave permission for 82 MTPA of iron ore. The Union Ministry of Environment and Forests (MoEF) sanctioned clearances. According to a statement by former chief minister B S Yeddyurappa in the Assembly in 2010, between 2003-2010, 30.5 million tonnes of iron ore worth Rs 15,245 crore was plundered from Bellary. The Lokayukta’s final report in July 2011 estimated the state’s loss due to illegal mining was more than Rs 16,000 crore. Yeddyurappa had to step down from the chief minister’s post since he was also indicted in the report. Janardhan Reddy has been behind the bars since September 2011. Large-scale mining in Bellary led to severe damage to its environment, reveals an environmental impact assessment by the Indian Council for Forestry Research and Education (ICFRE), Dehradun. ICFRE did the study in 2011 on behalf of the state government as directed by the Supreme Court. It found 9,500 ha of forests have been cleared for mining in Bellary alone. Air has been severely polluted and groundwater contaminated with iron, manganese and fluorides. A Comptroller and Auditor General (CAG) report released last year reveals increased incidence of tuberculosis, respiratory disorders and decreased livestock population in the region. In the interim report submitted in April 2011, CEC had expressed shock and concern over the magnitude of legal violations. All mining scams in the country become insignificant in front of Bellary, it observed. In its final reports, CEC changed stance and suggested the court should allow mining. “CEC seems to be acting as an engine for resuming mining rather than protecting the forest and the environment,” alleges Hiremath. For restarting mining, CEC classified mines into A, B and C categories, taking encroachment as the criterion for determining whether their operations were legal or illegal. Forty-five mines which did not encroach or encroached in small ways outside their sanctioned area come under category A. Category B mine are those which encroached an area up to 10 per cent of the lease area through mining pits and up to 15 per cent by way of waste dumping. This category includes seven mines along the inter-state boundary destroyed by Gali’s mines in Andhra Pradesh. The court has allowed all category A and 63 out of 72 category B mines to resume operations. It has suspended the seven leases till the boundary is fixed by the Surveyor General of India. Category C mines are those where the leaseholder has encroached on more than 10 per cent of the lease area through mining pits and over 15 per cent by dumping waste. The court ordered cancelling 51 leases, including all 49 category C leases. “The category C leases are cancelled because they were involved in flagrant violation of the Forest Conservation Act or mining in others’ lease areas,” the court observed in the judgement. The cancelled leases will be auctioned through international tenders. “This categorisation is faulty,” says Hiremath. It takes encroachment as the only criterion for determining whether operations were legal or illegal. It is arbitrary to measure the extent of encroachment as percentage of the sanctioned lease area, instead of the actual encroached area, points out P Vishnu Kamath, co-petitioner in the case. Kamath says there should be only legal and illegal categories, decided on the basis of encroachment, the quantity of ore extracted by leaseholders and other illegalities like mining without clearances, evading royalty and subletting leases. In fact, the Supreme Court in its order of September 28, 2012 had asked CEC to constitute a committee and assess within three months the actual quantity of ore illegally extracted by each leaseholder. “CEC has not constituted the committee so far,” says Hiremath. Moreover, category A leaseholders are not holy cows, Kamath says. Many of them have leases in other two categories. Minerals Enterprises Ltd, the first company that resumed operation after the ban, has two leases in category B. State-owned Mysore Minerals Ltd, which has been named in Lokayukta reports, has one mine in category A, but two in category B and one in category C. “This is as if you murder somebody in Andhra Pradesh and claim to be innocent in Karnataka,” says Kamath. Quite naturally, category A leaseholders are happy. Category B leaseholders heave a sigh of relief and prefer not to comment on categorisation. Those who come under category C are crestfallen. They argue that the Mines and Minerals (Development and Regulation) Act has not fixed any percentage for assessing encroachment, and hence such categorisation violates the Act. Anil Lad, owner of VSL Mining Company and the newly elected MLA from Bellary, says he will file a review petition against putting his mine in category C. Tapal Ganesh, a small-time mine owner, the only one who resisted Gali’s diktats, sounds depressed. His mine falls among the seven suspended by the court. “I do not think I will be able to start my family business in near future,” says he. He was physically attacked by Gali’s goons when in 2010 he tried to give statements to CEC. To meet the state’s requirement, the court has capped the amount that can be extracted from the region—25 MTPA from Bellary and 5 MTPA from Chitradurga and Tukmur. It says the ore produced should be used only by the steel and other industries in Karnataka and neighbouring areas. The judgement does not ban export, but says only those ore rejected by the domestic industries can be exported. It has also lifted the embargo on issuing new mining leases. To avoid illegalities, the court has asked the leaseholders who have been allowed to operate to get all clearances afresh. Besides, they will have to implement reclamation and rehabilitation (R&R) plan in a time-bound manner. The main thrust of R&R plan is afforestation, developing safety zone, green belt, soil conservation through controlling surface runoff by building retaining walls, check dams, rock-fill dams and stabilisation of accumulated waste dumps. ICFRE is preparing R&R plan for each mine and has done it for 70 leases. Category A mines can start mining after initiating R&R plan and after the monitoring committee, set up by the Supreme Court in 2011 to carry out e-auction of the ore, certifies its progress. Category B mines will have to complete R&R plan before resuming work. Though leases of category C mines have been cancelled, they will also have to implement R&R plan. “Nobody can escape from implementing R&R,” says Dipak Sarmah, additional principal chief conservator of forests and chairperson of the monitoring committee. Forest Development Tax (FDT): 12 per cent of net sales value. The tax was introduced in 2008. Mining companies moved the high court, which ordered to pay 6 per cent tax till the case is finalised. Case pending. Expenses of implementing R&R will vary from plan to plan and will be between Rs 5 crore and Rs 20 crore. Besides implementing R&R plan, the court asked category B and C leaseholders to pay penalties: Rs 5 crore for each ha encroached by way of mine pits and Rs 1 crore for each ha encroached for dumping overburden initially. Kamath says it is paltry compared to the 500-600 per cent profit margin in the business (see ‘Economy of mining...’). The court has asked the monitoring committee to retain 10 per cent of the sales proceeds of old stock of A and B leaseholders and the entire sales proceeds of the old stock of C leaseholders. The sales proceeds, together with the penalties and the amount received through auctioning category C mines, will go to a special purpose vehicle (SPV), called Karnataka Mineral Rich Region Development Corporation (KMRDC). It will implement an environment management plan of Rs 30,000 crore for 30 years for mining-affected zones. The projects include health, education, water supply, employment and biodiversity conservation “for ensuring inclusive growth of the area surrounding the mining leases”. Ironically, the fund will also be spent on setting up facilities like conveyor belts, railway sidings and widening of roads, which can be used for transporting iron ore. 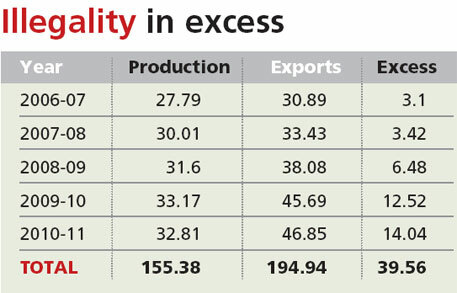 Besides, at a production rate of 25 MTPA, the iron ore deposits of Bellary will be exhausted within 40 to 50 years. The nation will not be able to pass on its rich resources to the next generation. “This is against the principle of intergenerational equity,” says Hiremath. In fact, In 2010, while illegal mining was at its peak, the state government was signing MoUs with steel companies, including Tata Metaliks, Arcelor Mittal India, JSW Steel, Posco India. The industries have promised to invest Rs 1.2 lakh crore. Sagar Dhara, director of Hyderabad non-profit Cerena Foundation, says ICFRE and CEC should have quantified the environmental damage in monetary terms before recommending resumption of mining. Cerena Foundation did a study in Sandur taluk of Bellary on behalf of the petitioners and estimated a loss of Rs 200 crore a year in agriculture alone. A moratorium on mining should have been declared for a few years till the physical and biological reclamation got completed, he says. Amlan Aditya Biswas, deputy commissioner of Bellary, says the ban did not affect the district’s economy much. Bellary has been an agrarian economy. At the time of the ban, some 10,300 people were employed in 70 active mines in the district. After companies retrenched workers, local residents who had joined the mining force returned to their traditional livelihoods (see ‘Onion v ore’). In Bhujanganagar village in Sandur valley, farmer Bharmappa got a bumper harvest of onion despite this year’s severe drought. “I harvested 44 tonnes of onion from one hectare,” he says, standing tall amid his farm hands. “When mining was in full swing, yield had gone down to 24 tonnes,” says he. Besides, it was difficult to get farm hands then. The fertile valley is known for its vegetables and onions. But following the mining boom many had leased out their farms for stocking iron ore and for mining. For the rest, it was difficult to grow crops due to iron dust. Since the ban, residents have returned to growing onions, maize and millets. The state also did not incur any revenue loss during the ban. “Instead, revenue increased even when production came down,” says H R Srinivas, director of the states mines department in Bengaluru. Before the ban, IBM decided the price of iron ore and it used be around Rs 1,300 a tonne, he says. Since the ban, sale is done through e-auction by the monitoring committee and the rate was fixed by NMDC. “Average price rose to Rs 2,500 a tonne,” explains Srinivasa, who is also the convener of the committee. Transport was the sector severely hit by the ban. Many had bought tipper trucks on credit during the boom to transport ore to ports in other states. “Every tipper truck employed at least three people,” says B Badewali, president of Hospet Truckers Association. With the ban about 3,000 tipper trucks are now lying idle. Repaying has become difficult the owners and banks have started loan recovery procedures. In the last 20 months, in the absence of reckless mining, forests and streams have started showing healthy signs. “We have spotted a few sloth bears and a rare species of snake that was seen in India only once before,” says S Manikandan, deputy conservator of forests. Despite the court’s approval, it will not be easy for many companies to resume mining since they are fighting criminal cases in lower courts among themselves. The CBI is also investigating a few cases related to illegal mining. The court has clearly said its judgement will not affect the ongoing investigations. The petitioners also plan to approach the court again to review the judgement. They had asked for legal actions against all those involved in illegal mining, including those named in Laokayukta’s reports, and had prayed for two independent committees, one with powers to prosecute and the other with expertise to monitor R&R plan and SPV. “The judgment has not addressed many of our concerns,” says Kamath. Will the Bellary prescription work for Goa? The Codli mines in South Goa resemble large amphitheatres flanked by flights of steps. 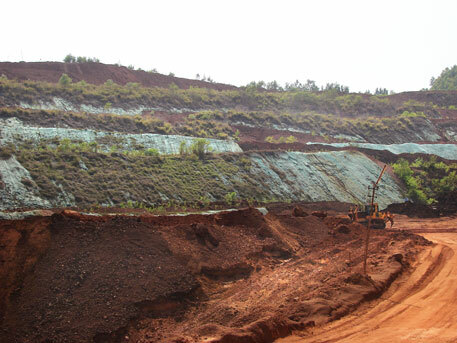 Till a few months ago, excavators and earthmovers could be seen here tearing into the crust to scoop out red earth that contained high concentrations of iron ore. Tipper trucks would then transport it to Murmugao and Panaji ports from where ships ferried the ore to destinations like China. Today the whir of turning wheels is missing in Codli. The mines, owned by one of the country’s biggest mining firms Sesa Goa, are waiting like 138 others for the Supreme Court order to resume mining. The ban is not only on mining. Companies cannot even sell their iron ore stocks. “We have three million tonnes of iron ore lying but cannot sell it until the court allows,” says Joseph Coelho, manager of the Codli mines. Mining activities had come to a halt in Goa much before the Supreme Court ban. The state government dealt the first blow. In September 2012, days after a commission headed by Justice M B Shah submitted its report to Parliament citing illegalities in all mines in Goa, the government temporarily suspended mining activities in the state. That month, the Union Ministry of Environment and Forests (MoEF) issued a direction under Section 5 of the Environment Protection Act, 1986, to suspend environmental clearances of all 139 mines in Goa. The Supreme Court order came in October 2012, following a petition by Goa Foundation, a non-profit working on ecological issues. It ordered that the mine leases, found violating the norms by the Shah Commission, should be suspended and asked its Central Empowered Committee (CEC) to investigate the illegalities. Goa has also set up its own inquiry committee under retired judge R M S Khandeparkar to investigate the Shah Commission report. Justifying the new committee, Goa’s deputy chief minister Francis Dsouza says, “The question is whether the apex court should have stopped all the mines. Legal mines should not have been shut as the livelihood of a large number of people is at stake.” Goa today finds itself caught between livelihood concerns and sustainable use of resources. With no solution in sight, the state could be handed down a model recently introduced 400 kilometres away in Karnataka. There is a constant fear that the model pronounced in the Supreme Court judgement for reopening mines in Bellary could be used in Goa. Atul Jhadav, president of Goa Barge Owners’ Association, explains: If the Bellary model is applied to Goa, most mines would fall in category C. The Supreme Court has cancelled leases of category C mines in Bellary because of highest number of illegalities, including dumping of overburden (soil removed to extract the minerals) outside the mine lease areas. Most mines in Goa dump their overburden outside the lease area, Jhadav says. Besides, mining is the backbone of Goan economy, says Nilesh Cabral, MLA from Curchorem in South Goa. Dharamaduda village is a few kilometres from Codli mines. About 80 per cent of the 12,000-odd population in this village earned their livelihood from these mines. Apart from direct employment, several residents in Dharamaduda own tipper trucks that ferried iron ore from the mines. Some worked as drivers and helpers in the trucks, while the others opened shops and eateries around the mines. Guru B Gaonkar, sarpanch of Dharamdauda, says a petrol pump set up in the village to fuel trucks used to pay tax to the village panchayat, depending on its business. It hardly contributes now. “We understand that mining creates pollution and traffic problems, but it is a trade off we are ready to accept,” says Gaonkar. He wants mines to be reopened as people from his village are migrating to distant places in search of work. State government figures show in 2009-10, revenue from mining contributed 13.5 per cent to the state’s GDP. This is on a par with the hotel and the tourism industry. This apart, the industry claims that mining provides direct and indirect employment to nearly 300,000 people, or half of the state’s workforce. Those who have lost their livelihoods now question why they are being punished when the fault lies elsewhere. “We were never involved in any illegal activity,” says William D’costa of Barge Owners’ Association. Most barges have loans of Rs 5 crore to Rs 6 crore attached to them. “Without mining we are unable to pay installments to the banks that are now sending us notices,” he adds. The association has written to the Reserve Bank of India and the state government to grant relief in loan repayment. The ban has impacted almost every household in Goa because the breadwinners are associated either with mining or the Murmugao Port Trust, says P M Pandiyan, chairperson of the trust. Since iron ore exports comprised 80 per cent of the port’s operation, commercial activity has come to a standstill. Last year, this profit-making venture accrued a loss of Rs 108 crore. It was its first loss in history. The trust has asked the state to step in, Pandiyan informs. 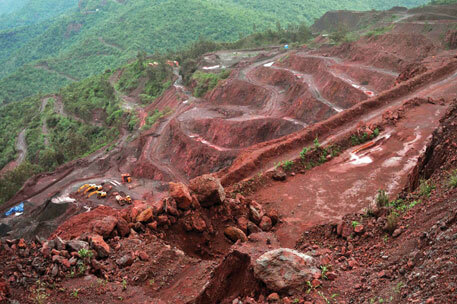 The stakeholders of Goa’s iron ore mining sector do not want to give up easily. They have united to form the Goa Mining People’s Front (GMPF). Christopher Fonseca of GMPF says 30 per cent of the state’s population has been jobless for eight months. “Environment is important but the government should think about our livelihoods too.” The state government has offered a year-long monetary compensation scheme for those who lost their livelihood because of the ban (see ‘Cushion for ban’). Subhash Phaldesai, MLA from mining belt of Sanguem, says this is not enough. Claude Alvares, executive director of Goa Foundation, says the government should instead compensate those who have been displaced after their farmlands have been destroyed by pollution from mining. “The mineral does not belong to the government. It belongs to the people of Goa. But our assets are being destroyed, while a handful make merry,” he adds. The reason for Alvares’ resentment can be found in the Shah Commission’s report. It points to a number of illegalities, including mining without licence, mining outside lease area, production of ore beyond permitted capacity, and illegal transportation. CEC’s interim report submitted in December 2012 reiterates most of these findings but presses for a detailed survey. One of the most serious concerns recorded by both the Shah Commission and CEC is a mismatch between production and export figures of iron ore from Goa. Data submitted to CEC by the Indian Bureau of Mines (IBM) and exporter’s association shows about 40 million tonnes of iron ore was exported illegally over a five-year period (see ‘Illegality in excess’ on p35). Mining companies say the additional exported ore came from overburden dumps. Earlier, IBM classified ore with less than 55 per cent iron content as overburden, which does not have much market demand. In 2009, it lowered the threshold value to 45 per cent. Overburden does not meet IBM threshold but it may still contain a significant amount of iron. Royalty need not be paid for overburden if it is not sold, says Mineral Concession Rules of 1960. But if it is sold or exported then a tax has to be paid to the state. A senior official of IBM says before selling this overburden, the state should be informed, which should ideally verify the quality and quantity of iron content and ascertain the royalty to be paid. Industry insiders say the state mines department usually does not inspect what the industry sells from the overburden. This gives the industry the leeway to export good quality iron ore as overburden and evade royalty. Mining companies in Goa used this leeway to benefit from the soaring demand in the international market that peaked in run up to the Beijing Olympics and continued even after the Games. A check on illegal shipping of minerals came only in 2010, after the state government made it mandatory for the companies to get a no-objection certificate from the mines department to export iron ore after paying royalty. Such illegality is at the helm of a recent spat between the state and the Centre over the authority to give permission for export of overburden. MoEF and the Union Ministry of Mines (MoM) claim it is the Centre’s prerogative to give permission for export of overburden. Responding to one such claim in March 2011, Goa opined that environmental clearance is not required to remove minerals from overburden dumps. But in October 2011, MoM wrote back asking for necessary measures to prevent passing off of illegally extracted ore as overburden. In July 2012, MoM again wrote to the state government that overburden handling, or removal of ore from overburden, for exports has an environmental impact and hence requires environmental clearance. The Goa government replied that overburden handling was stopped in September 2011. On the very day Shah Commission’s report was tabled in Parliament, MoM asked the state to ban removal of ore from overburden lying outside the lease area till an appropriate mechanism is evolved. This points to the fact that the authorities, both at the Centre and the state, were aware of these illegalities. S Sridhar, executive director of Goa Mineral Ore Exporters Association, has another concern. IBM does not allow mine lease holders to store overburden in mineralisation zone (areas that contain minerals). Given that mine leases in Goa are right next to each other, the only option is to keep them outside the lease area, he adds. Most mine owners in Goa started operating during the Portuguese period. Under the Portuguese Colonial Mining law the maximum size of a Goa mine is 100 ha and the mines are contiguous. Down To Earth analysed a few environmental clearances granted by MoEF. None of the clearances mentioned whether the overburden should be stored within the mine lease area. All it says is “overburden shall be stacked at earmarked dump site(s) only and shall not be kept active for long periods”. Whose buffer is it anyway? Even if one goes by Verma’s definition, there is ambiguity over who is the competent authority to approve projects in buffer zones. MoEF in May 2011, wrote to Goa’s Chief Wildlife Warden (CWW), clarifying that NBWL is the only authority to approve mining in the buffer zone. Approvals for mining within buffer without placing them before NBWL also violate the 2006 Supreme Court order. But more than 100 iron ore mining leases, including Sesa Goa’s Codli mines, have clearance only from CWW, though they fall in the buffer zone. “Our interpretation of the order in terms of competent authority was CWW. So we approached it for approval. Now with MoEF saying 10 km, this is clearly a grey area. This needs to be resolved urgently so that we know where we stand,” says Ambar Timblo of Fomento Resources. Now the state mining department has asked all mining companies to declare dumps with location, quantity and quality of the stock. “We estimate that there is 700 million tonnes of overburden. The department will now scrutinise these in detail,” says Verma. The Goa government now plans to auctions this overburden. From ecological point of view, overburden dump handling is important in Goa as its mining belt is close to major wildlife areas. 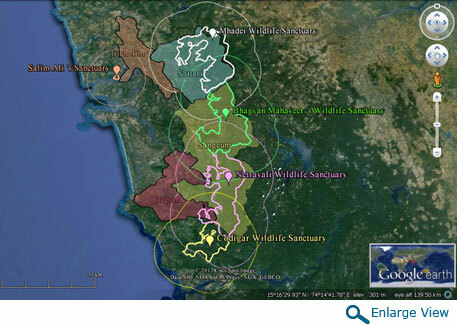 The iron ore-rich eastern Goa is also home to six wildlife sanctuaries and a national park. The CEC report says MoEF has cleared 20 mining leases within the sanctuaries. This contravenes the February 2000 order of the Supreme Court, which prohibits mining leases within national parks and sanctuaries, and applies retrospectively. Violating the December 2006 order of the apex court, MoEF has approved another 23 mines within one kilometre of the sanctuaries. CEC, in its interim report, has recommended quashing all the 43 permissions, identifying those responsible for the approvals and initiating action against them. It is not just MoEF, the state is also to be blamed for such illegalities. Of the 120 mining leases cleared by MoEF, 112 are located within 10 km of protected wildlife habitats. Many of them have approvals only from Goa’s Chief Wildlife Warden. This is when the apex court in its 2006 order had observed that the standing committee of the National Board of Wildlife (NBWL) of MoEF had to peruse and approve all environmental clearances for projects located within 10 km of protected wildlife habitats. There is confusion over the competent authority to clear activities in this zone (see ‘Whose buffer is it anyway?’). CEC’s interim report states “MoEF by its various actions and inactions de facto ensured mining operations in a large number of leases continue to take place in violation of directions of this Hon’ble Court.” CEC thus recommends that all environmental clearances granted to mines within the 10 km buffer be suspended and scrutinised by NBWL. The court can then decide their fate based on NBWL’s recommendation. What does Goa have to look forward to given that illegal mining has taken its toll not only on its ecology but also on economy? Mining in Goa may not start for the next five years, say Alvares. “We have foolishly stuck to our heritage of mining.” He says if Goa ends up like Karnataka, mining should be capped at 10 MTPA. Timblo says it is unlikely that production will start soon and the cap on production will be the new model of mining in Goa. Managing director of Sesa Goa, P K Mukherjee, refuses to comment on this subjudice case but says his only concern is about his employees. Verma hopes that conditions are not too stringent, like in Bellary. CEC has recommended a model similar to that of Bellary, where an environment impact assessment and reclamation and rehabilitation plan need to be prepared by Indian Council for Forest Research and Education. It has also suggested a block-wise cap for mining. But is the Bellary formula the right template for the rest of the country? Can it bring order to the iron ore mining industry? Will it help sound mining or mining companies? The Bellary case—and perhaps now the Goa case—is setting a precedent for mining regulations in the country. It will define how the offenders are judged, how serious is their crime and how they should be penalised. In other words, it is developing the mining penal code for the country. It is setting the framework for future environmental management, including the limits on how much mineral extraction is “sustainable”. In addition, the judgements set the framework for how local people will “benefit” from mining. Therefore, in many ways these decisions are overarching and are definitely needed as the current regulatory system has been decimated. The question that needs to be discussed is whether the judgements go far enough in deciding the sustainable framework for mining in the country. Or, indeed, if these are in the right direction. The Central Empowered Committee (CEC) of the Supreme Court has classified mining into three categories—A, B and C—taking encroachment as the basis of the nature of offence committed. To judge the quantum of offence, CEC has taken the ratio of the lease area of each mine to respective encroachment. Category A: No major encroachment outside the lease area. This does not mean this category is “clean” on other accounts. The mine operations are allowed after the reclamation and rehabilitation (R&R) plan is started. 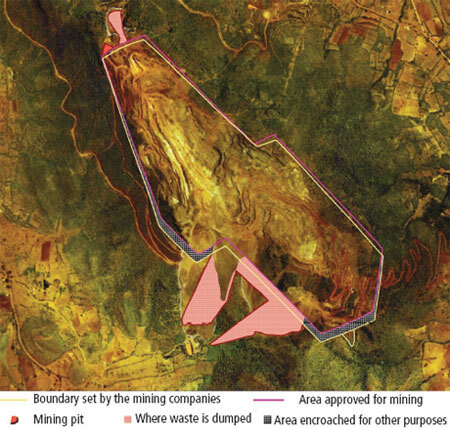 Category B: Encroachment up to 10 per cent of the mine lease area for mining pit and dumping of waste in area up to 15 per cent of the lease area. They have to complete R&R and pay some fines before resuming operations. Category C: Encroachment more than 10 per cent of the lease area and dumping of waste in area, which is more than 15 per cent of the lease area. Their lease will be cancelled and then auctioned for captive use. The bottom line, after all the rigmarole and more than two years of judicial scrutiny, is that all mines, big and small, big offenders or small offenders, will continue in some form or another. The problem with this manner of categorising penalties is threefold. One, that CEC has defined the “nature” of offence in a very limited manner, which does not take into account the environmental fallout or the cumulative impact of the mines in the region. In this way, when mining reopens—first A, then B and then C—it could well be business as usual. The best that is being offered is that there will be an R&R plan, which will take into account “afforestation, check dams, stablisation of waste dumps, soil conservation, rainwater harvesting and use of modern mining technologies”. There is nothing to suggest that these methods will add up to sustainable mining, even if a cap is put on the total mining that will be allowed. Two, this rulebook could well end up incentivising large mines to commit large offence. The simple fact is that the Bellary formula will work against small mines, as it is based on quantifying the extent of violation as a percentage of the mine lease area. This will end up “legalising” non-compliance of large mines. Mines with large lease areas, for instance of 1,000 hectares, could have encroached 100 ha and still be in legal B category. Three, the issue of illegal iron ore extraction and sales has been ignored by CEC in defining illegality. In 2012, the Supreme Court directed CEC to assess within three months the actual quantity of illegal iron ore that was sold, so that companies could be fined. But this has not happened. So mines have opened and many more will open soon, and all the talk of recovering ill-gotten funds may well be brushed under the carpet. Small wonder the mining barons are once again in power in Bellary. Allowing C category mines in the future once they are auctioned for captive use presumes illegal mining will thus remain in check. But the fact is captive mines discount natural resource, allow transfer pricing and promote poor mining practices, as is evident from cases across the country. Worse, it will distort the market by creating certain companies who will have access to cheap iron ore through captive mines, while others will have to buy ore from the market at higher costs. It is also clear that companies with cheap raw material are not driven to innovate or to be frugal and efficient in their use. For instance, the recent rating of Indian steel companies done by Delhi non-profit Centre for Science and Environment found that the three top-rated companies did not have captive mines for iron ore—their cost of raw material was high and they invested in efficiency, which in turn brought down emissions. Companies with captive mines—Tata Steel, Jamshedpur; Jindal Steel and Power Limited, Raigarh; and SAIL, Rourkela—were rated low in environmental performance. The Dehradun-based Indian Council of Forestry Research and Education (ICFRE) has recommended in its environmental impact assessment (EIA) done at the behest of the Supreme Court that there should be a “cap” on the quantum of iron ore mined in the Bellary region. The Supreme Court has endorsed the recommended “cap” of 30 million tonnes per annum (MTPA)—25 MTPA in Bellary and 5 MTPA in neighbouring Chitradurga and Tumkur districts. The “cap” is not based on environmental or socio-economic factors. Instead, the ICFRE report mentions that it is suggesting this limit “since the annual iron ore requirement of Karnataka is around 30 MTPA and majority of its demand is met from Bellary”. This sets a bad precedence for environmental governance and has huge implications for inter-state matters. The limit is unscientific and is not based on cumulative impact assessment, taking into account the carrying capacity of this eco-sensitive forested region. It would also signal that states should “mine” for their own captive consumption—mine and only mine. The Supreme Court has directed that a special purpose vehicle (SPV)—the Karnataka Mineral Rich Region Development Corporation—be set up under the chairmanship of the state chief secretary. The SPV will collect the fines, penalties, money raised from the auction of C category mines and 10 per cent of the sale price of all iron ore sold from Bellary, and will implement projects for socio-economic development and mining infrastructure. In other words, a parallel government is being proposed to the district administration. It is not clear how this recommendation is in consonance with what is being discussed currently in Parliament. The Mines and Minerals (Development and Regulation) Bill, 2011, presently with Parliament, includes provisions for benefit sharing and local area development. Will the SPV model be in contravention of the Bill or will it set a precedent? There are four key departments that can be held most accountable for the extent of illegal mining in Bellary (and Goa). One, the forest department as it turned a blind eye to the takeover of its land. Two, the state mining department, which gave leases and clearances with total indifference. Three, Nagpur-based Indian Bureau of Mines, which gave permissions to increase mining from 20 MTPA to 80 MTPA without any care or scrutiny for impacts. And four, the Ministry of Environment and Forests (MoEF), which gave environmental and forest clearances to anyone and everyone without any assessment. The fact is government officers who “connived”, “consented” or simply did nothing to stop the rot have not been held accountable. The worst part is that today these departments—represented in the Supreme Court monitoring committee—have become all-powerful and are back in the business to decide the fate of Bellary without any institutional reform. The Bellary model does not provide the design of an effective institutional framework for environmentally sound and regulated mining in the country. The model, instead, once again depends on committees of the court to oversee management, which is at best a short-term solution. In this way, the Bellary case does not mean the end of illegal mining or a new dawn for sustainable mining in the country. While I appreciate the rigour that has gone into documenting this report, it is not not nearly as hard-hitting as it ought to have been, given that we now have access to both The Shah Commission Reports and the CEC findings, and indeed Goa Foundation's petion before the court, or even better its counter-affidavit that severely demolishes the Parrikar government's somewhat spurious affidavit. Agreed; mining can never be sustainable, but then how do you get the metals to make all the things you need in the course of daily life? Right from the safety pins to the utensils you use... where does the metal come from? In India lakhs of crores worth minerals are mined every year all over the country. Some part is meeting the local needs and other part is meeting legal & illegal export in terms of raw and finished products. If one wants to present the real picture without any bias, start from the area in different states, quality of ore, leased area plus illegal mining area, local use, export (legal & illegal), etc. Then tell to the people who are the real culprits. Instead of that targeting one or two like politicians may not be a good practice. The article goes in this direction only. Against Gali the case was filed by politicians to serve their political game. Iron ore mining was not considered an important issue when the price was low. In Andhra Pradesh the mining of iron ore started even before Gali was born. This clearly indicate our legal system, investigating system and environmental movement system are serving the vested interests with biased mind set. You wrote Gali destroyed interstate boundary but at the same time you wrote Supreme Court asked survey to identify the boundary. This is not a good. I wrote an article in Vaartha [12-8-2010] -- "Mineral industry: discussion". 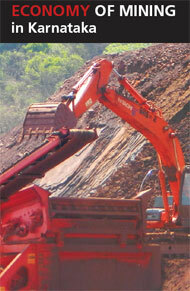 In 2006, globally iron ore mining data shows: global 1690 mt; China 520 mt, Australia 270 mt, Brazil 300 mt, India 150 mt. In 2003 around 105.5 mt produced of which 31 mt exported. In our country High grade iron ore is available 1280 mt; MP 630 mt, Orissa 320 mt, Karnataka 220 mt, Bihar 85; medium grade 4200 mt; Bihar 1790, Orissa 1300, MP 485, Karnataka 440, Goa 150 mt -- low to medium grade in AP, Kerala, Maharashtra, Rajasthan. This clearly shows it is not alone Karnataka and Goa there are other states where iron ore mining is carried out. While writing such articles bring out all the culprits. How come Andhra is left out of the mining loot story ? It is good for the nation if we learn to keep environmental and political affiliations apart . Also everyone knows of the problems ....it would be great when environmental publications start focusing on the solutions as India has become a net importer of iron ore from a net exporter since mining was banned in some states and that has added to the rising current account deficit every month. In many parts of the world people are involved in sustainable mining. We in India need not re-invent the wheel but only follow those practices. Instead of that we are banning existing mining blocks which have already been devastated environmentally and planning to issue licenses in green field areas that will involve more cutting of forests. The existing areas under mining are inefficiently mined, only from the surface to keep mining costs to the bare minimum. Why is that happening? Is anyone talking about it. Where are the regulatory norms and the regulators which can be easily put in place, considering the enormous revenue generated from the resources and the technology advances of satellite imagery. Every cubic feet of mining resource extracted can be today monitored at a very reasonable cost by using technology if there is a political will. It is the MOEF that has to educate itself adopting global best practices and then enforce the norms, without political bias that today permits Jindal but not Vedanta to put up bauxite mining projects in India.